Statements like “Ich kann doch nicht shufflen!” or other language mixings belong to the everyday life of bilingual children. This book deals exactly with this topic and contains a case study about English-German bilinguals having lived in Great Britain and the U.S. and now growing up in Germany. Thereby, the study is based on the current theory of bilingualism. The study was conducted with a family living in Germany whereby the children were 8, 10 and 12 years old. They were studied for 2 weeks in their everyday lives, and the results should be of interest for all kinds of readers who are interested in languages and their acquisition or who are personally involved in bilingualism. In chapter 1, the term ‘bilingualism’ is described briefly, the reasons for the chosen topic are portrayed, and the family of the case study and their special situation is introduced. In the next chapter, a general overview about the theoretical background of bilingualism is given. Important sub items of this chapter are the current status of research, the ways in which bilinguals can be categorized, the ‘one person – one language principle’ and interferences and code-mixing as important components of bilingualism. In chapter 3, the case study itself is presented. Here, the aims, methodology and materials of the study are described. Subsequently, the results of the case study are brought into relation with the underlying linguistic theory. 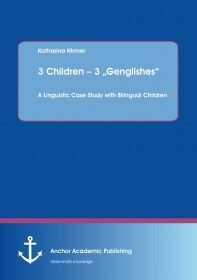 At the end of the book, the findings of the study are summarized, and further, the consequences for the three children’s language acquisition processes are drawn.